*** I received these books from WorthyKids/Ideals for free in exchange for an honest review. Being a mom to a toddler/preschooler, I am always looking for fun ways to teach my daughter the basics--- colors, numbers, letters... those basic skills that will help prepare her for the time when she starts school. Being a Christian mom, I am also always looking for fun and simple ways to introduce a foundation for reading the Bible. First up, let's talk about the Colors in the Bible. With each turn of the page, we see a familar Bible story--- Adam & Eve, the lion's den, Noah's Ark, etc. These may be stories that you child is already familiar with or they may be new, but this book doesn't go into the actual stories but rather just gives you those iconics scenes and characters from each story and focuses on the colors. What a fun way to learn the colors though, right? For my daughter, she already knows all of her colors so she's not learning much in that aspect, but it's a very short and simple book--- perfect for her to follow along with and eventually read on her own when the time comes. Either way, she absolutely loves it- the colors, the artwork, the simplicity, such a cute little story! Next up was the Numbers in the Bible. 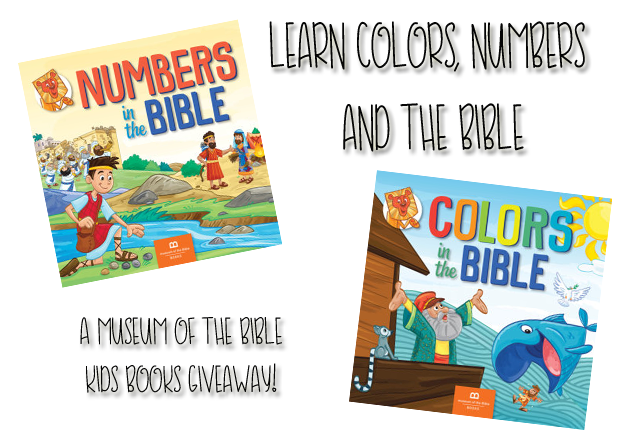 Much like the colors book, this featured a simple story and introduced several popular Bible stories, but focused on the numbers throughout those stories rather than the details. My daughter is actively learning to recognize her numbers, so this was really great practice for her. She could tell me what number was on the page (which made her feel quite grown up!) and count the pictures to confirm too. This was perhaps her favorite of the two and she loves reading it again and again. At 4.5 years old, my daughter is at the higher end of the age range for these, so I could see that for her personally parts were a little TOO simple, but she loved them nonetheless. For a younger toddler, these would be even better! They can get the foundations of the Bible AND learn these oh-so-important skills too. How fun is that! From the perfect baby shower or first birthday gift to the perfect Easter basket addition for babies and toddlers, these books truly are an ideal option. They are available to purchase now at your favorite Christian book retailers.